This might be TMI, but I am notoriously bad about brushing, flossing and rinsing my teeth. (Although I did get a score of 85 on TheraBreath's free oral health evaluation, which means "good oral health") I need my hubby to constantly remind me to brush, because I become so busy and nuts that by the time I'm ready to roll into bed (at 2am) it's so late and I REALLY don't want to take the 5 minutes to brush, etc. Anyways, I was introduced to a new kind of tooth care called TheraBreath, and I may get much better about brushing now! "TheraBreath is a revolutionary premium oral care system created by Doctor Harold Katz at the California Breath Clinics. The exclusive, original formula went on the market in 1994 and has been used by over 1,000,000 people world wide to solve the problems of bad breath and unpleasant mouth taste. In that time, [their] original formula has gone through dozens of refinements, making it the most complete and effective solution to the embarrassing personal problem of halitosis. Continuing his pioneering research, Dr. Katz expanded on [their] original TheraBreath Toothpaste and Oral Rinse products to address other problem areas in personal care. [They] now manufacture very popular products for teeth whitening, the clearing of tonsil stones, premium periodontal therapy products, specialty chewing gums, and even bad breath treatment systems for pets!" I'm really loving my new toothpaste, mouth wash and lozenges! I especially love the mandarin mint flavor of the lozenges. (And since they're only 2 carbs each, I can fit them into my Atkins diet!) One thing that I think is super cool is the fact that you can swallow the mouth wash, and it's completely safe. There's even a benefit to swallowing it because it reaches bacteria that live in your throat beyond the point where you gargle. One of the things I hate about brushing my teeth is the fact that I am nervous about swallowing toothpaste and mouth wash. I end up rinsing out my mouth dozens of times just to make sure it's all gone. But with TheraBreath, I don't have to do this! 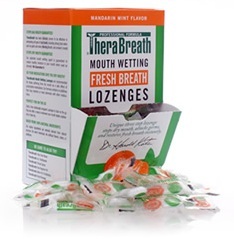 The TheraBreath products have really helped stop my bad breath and have encouraged me to take better care of my teeth. I also really like how the products don't contain sugar, and some of them even contain Xylitol (which is a natural zero calorie sweetener that is very good for your teeth). Overall: We give TheraBreath a 9/10! How would you like to win 1 tube of TheraBreath toothpaste and 1 bottle of TheraBreath Oral Rinse? 4) Post on your Facebook wall about the giveaway using the link below (make sure it's linking directly to the giveaway page). Then, comment here with the permalink to your Facebook wall post. 12) Vote for this blog by clicking each of the following icons for 1 additional entry per click (a total of 4 additional entries). You can do this once per day, and be sure to comment on all giveaways you're in! Please comment 4 times every day that you click to let me know you clicked for each one. We were sent a tube of toothpaste, a bottle of mouth wash and a box of lozenges free of charge for the sole purpose of this review; no other compensation was received. All opinions expressed are my own. This is a MamaBuzz review. The product was provided by TheraBreath for this review." I also follow your blog on facebook. barb g.
Your blog button is on http://www.diabeticsnacker.com/ barb g.
I receive your email newsletters. barb g.
Entered the Hair Coverings Store giveaway! Entered Reading Glasses Shopper giveaway!